Another year (and 4 months, but who’s counting…) has passed and I haven’t blogged. What can I say? Life and flowers get in the way. I’m hoping that 2017 is the year that blogging sticks. I have so many past events I want to share, that I feel like this may finally be the time. Besides, our beautiful new website is motivation! I couldn’t be happier with the bright, crisp, airy feeling of the site now. So, let’s get to the reason for today’s post, shall we? Today I’m going WAY BACK to May 2013. I know, I know, it was almost four years ago. It’s just too pretty not to share. 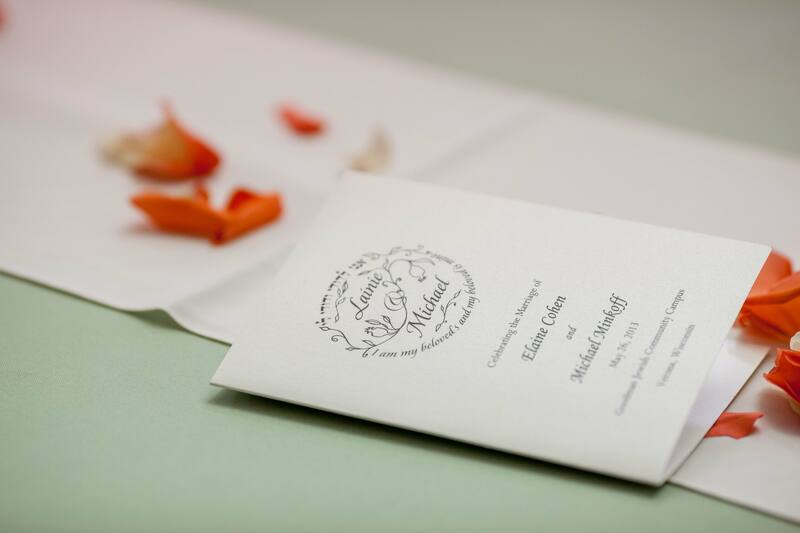 This was the first wedding I got to work with my wonderfully talented studio-mate Laura on! 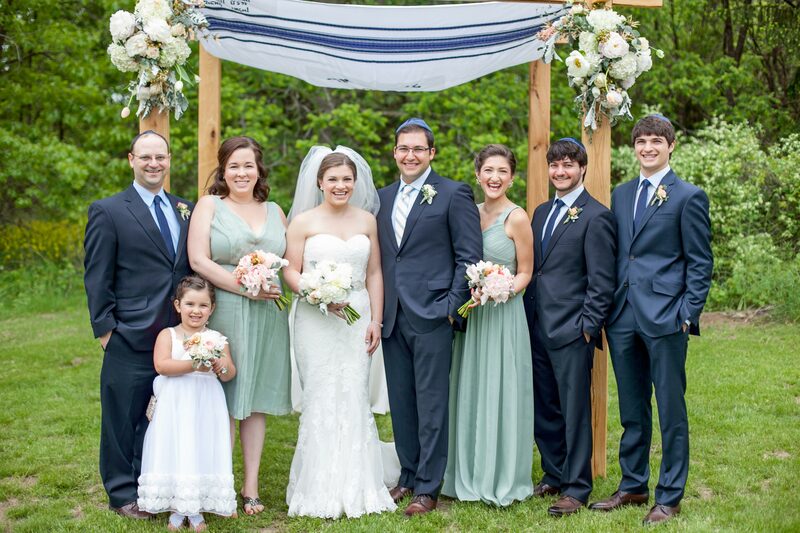 All photos in this post are courtesy of Laura Zastrow Photography. 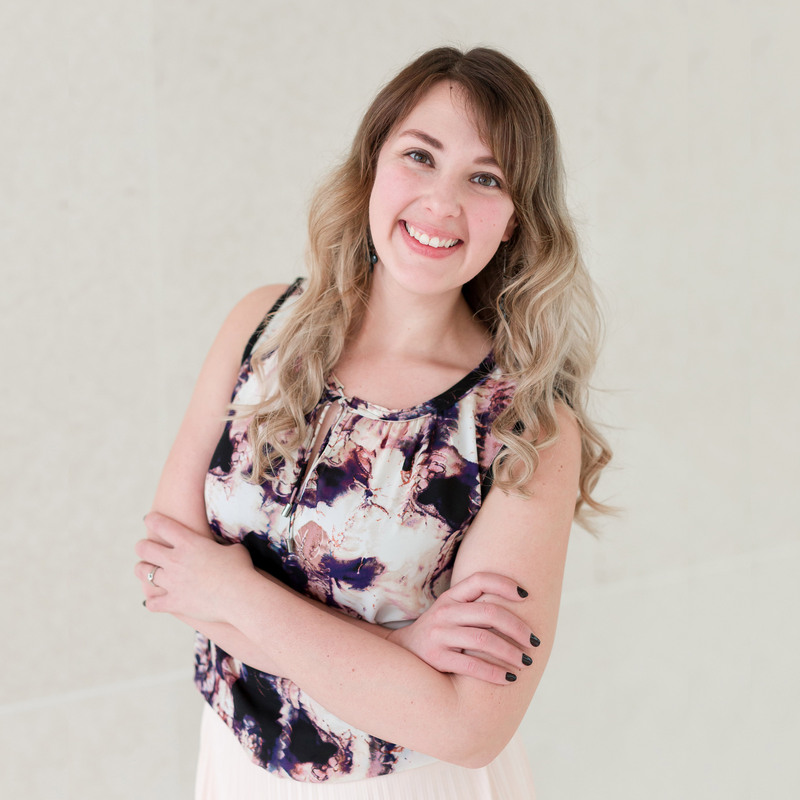 Thanks for the gorgeous images Laura! 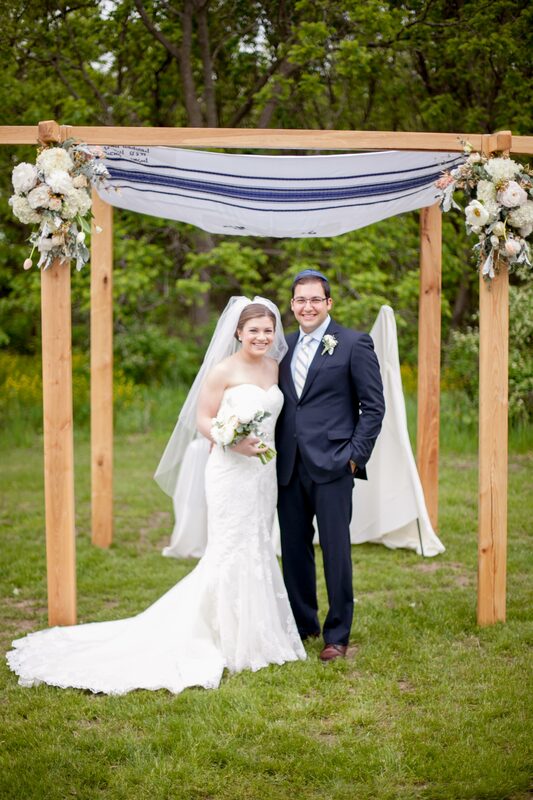 Mike and Lainie were a gem of a couple who married at the Goodman Jewish Community Campus in Verona. 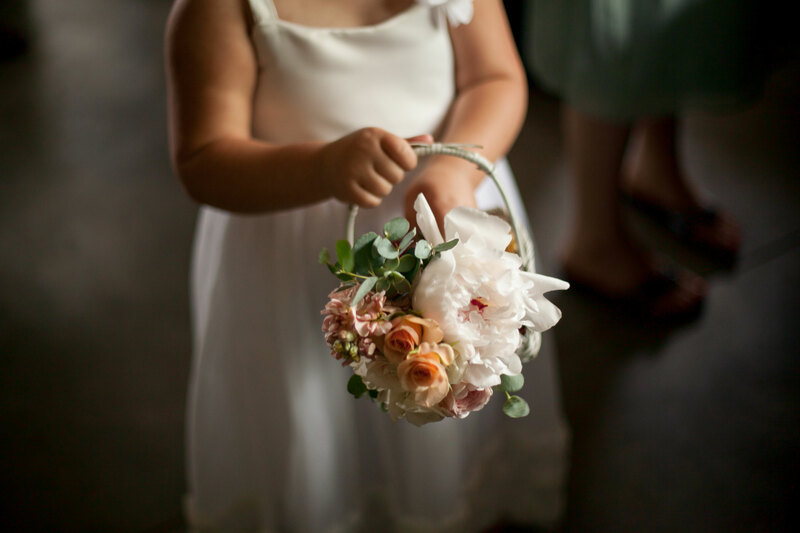 Flower girl baskets are adorable. Sweet little hands holding sweet little blooms. 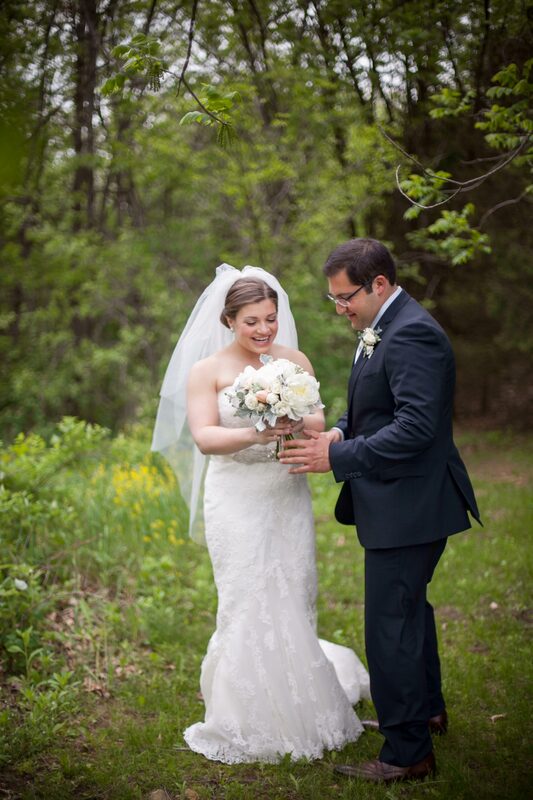 Lainie carried a classic white and blush hand tied bouquet. The month of May means PEONIES and these beauties smelled devine. I love this photo right after their first look. 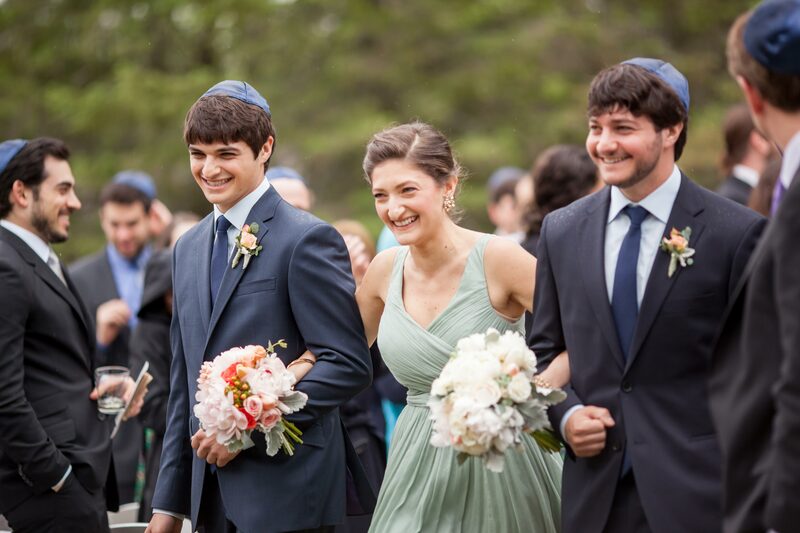 Her excitement over her bouquet radiates through her expression. 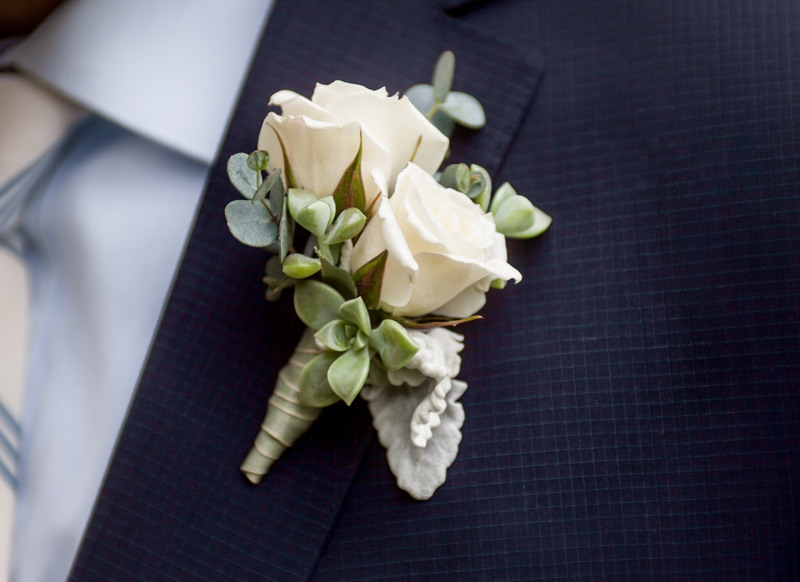 Mike’s boutonniere was a simple mix of spray roses and succulents with a clean ribbon wrap. One of the most memorable parts of the day for me was the rain. 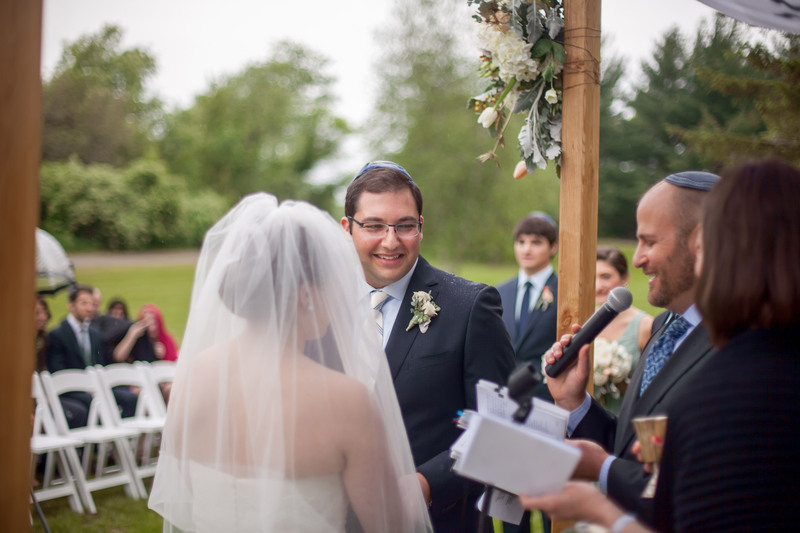 Determined for an outdoor ceremony, we waited for a break in the showers to appear. It did. But it didn’t last long! The reception started with a cocktail hour. 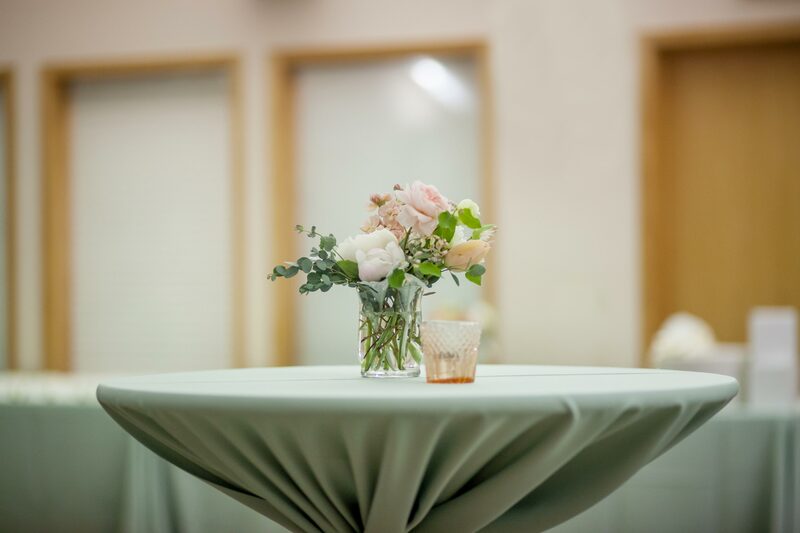 Linens in the softest sage green to match the maids gowns were the perfect accent to small cocktail arrangements. 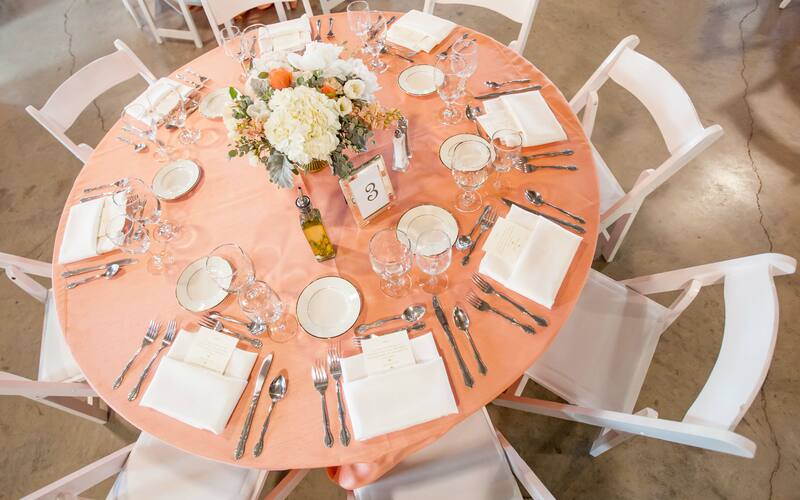 Our blush pink candle holders added a warm glow. Flowers for dinner were romantic, rustic yet elegant and polished. 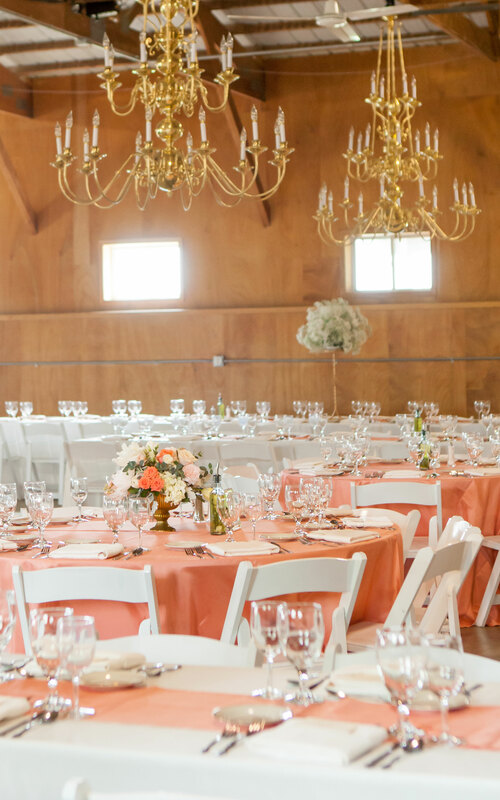 I loved the gold candelabras and coral linens used to transform the reception space. 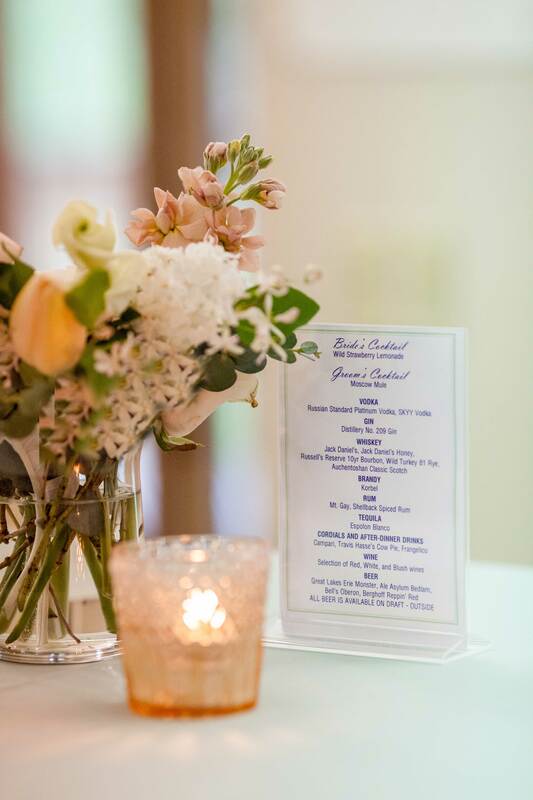 Lush, low centerpieces adorned the round tables. Heavy gold footed bowls filled with pastel blooms made a beautiful statement. 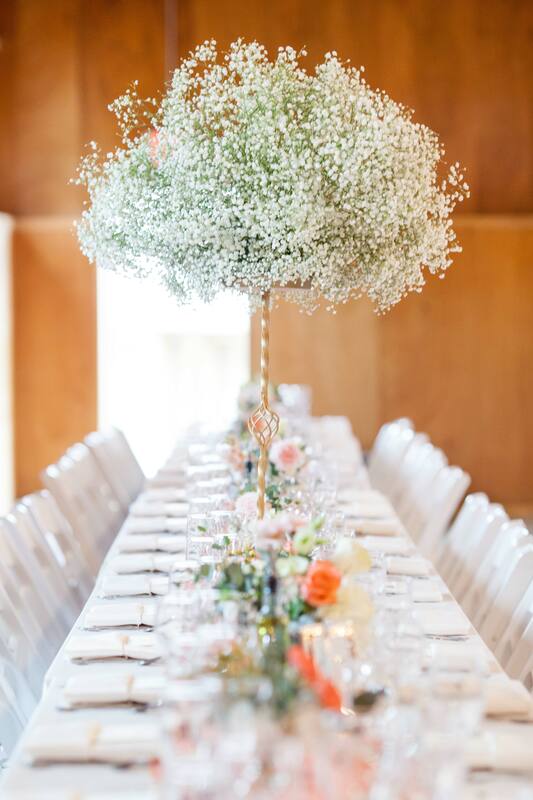 Long tables had crisp white linens with a combination of tall babies breath centerpieces and small low floral accents. We weren’t the only ones who thought this day was gorgeous. 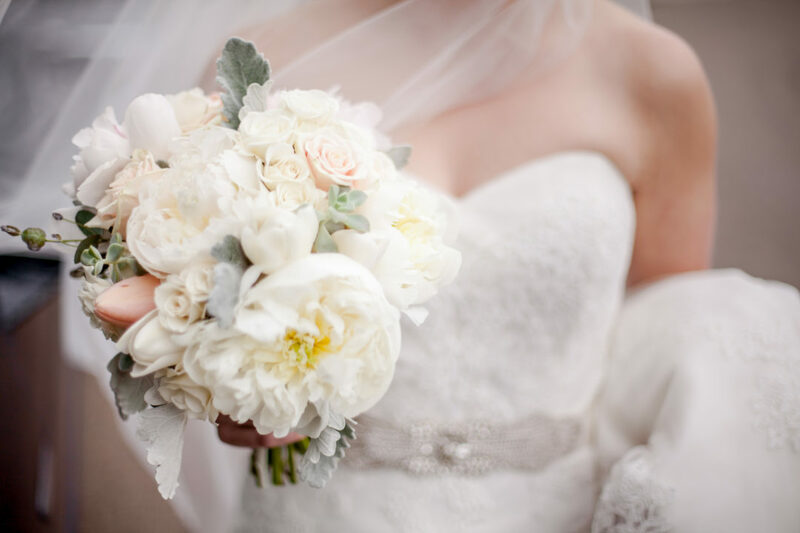 Wisconsin Bride Magazine featured this stunner in their Spring/Summer print edition. See that feature here!